In this 2006 masterclass, you’ll learn how to start using counterpoint in your playing. Sid Jacobs shares insights and tips he has discovered from studying the music of Bach, Bird and Bill Evans. You’ll see how seemingly simple ideas like embellishing guide tones can develop into two-part playing that evokes both classical music and jazz sensibilities. 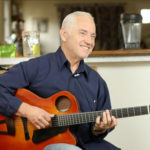 Sid uses examples of tunes including “Yesterday”, “Darn That Dream”, “Autumn Leaves”, “All The Things You Are” and “You Stepped Out of A Dream” to show how the same concepts work on different chord progressions. Along with 18 pages of notated examples, you will have a lot of material to dig into and incorporate into your playing immediately. This class will help jazz guitarists looking into spicing up their solo guitar arrangements as well as create more sophisticated textures for duo and trio playing situations. Get out from playing chord-melody and start using a melody-chord approach to arranging and improvising. 18 Pages of PDF materials in standard notation and TAB. Full video is 1 hour 10 mins. Excellent, Sid is a great teacher explains all the topics very clearly, this stuff is helping me a lot in developing this language. Many thanks Mike and Sid by this contribution.